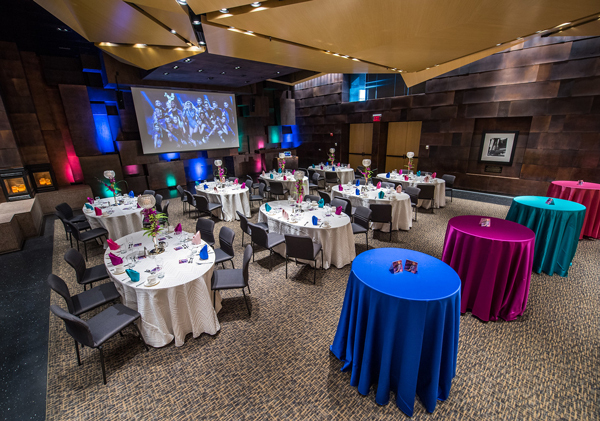 The Johnson Great Room is the largest private meeting room in the McNamara Alumni Center, voted Best Meeting Venue by Minnesota Meetings & Events magazine 2007 to 2012 and Best High-Tech Venue 2015 by Unique Venues. It is one of the most gorgeous and unique meeting rooms in the Twin Cities. Its superior built-in AV, wireless Internet and two-way video and audio capabilities make it a popular choice for Minneapolis meetings and conferences. It is also a lovely setting for special events including wedding ceremonies, fundraisers needing silent auction space and intimate award dinners. The MTV music video for the song "Drive" by the California band Incubus was even filmed here!